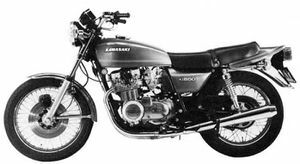 The Kawasaki KZ650B is a motorcycle produced by Kawasaki from 1977 to 1979. The Kawasaki Z650 was a motorcycle made by Kawasaki from 1976 through 1983. It had an engine displacement of 652cc featuring a double overhead camshaft. The gear box was a five speed. 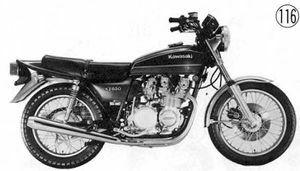 The Z650 was introduced to the trade in 1976 and was very popular. 64 bhp was claimed with a dry weight of only 465 lbs, making a top speed of nearly 120mph possible. But more importantly, this new model handled like no other Kawasaki. For once all the available power could be used in relative safety. The Z650 was considered the 'Son of Z1' having been designed by the Grand Master himself, Ben 'Mr Z1' Inamura. The Z650 had the agility of a 500 with the performance of a 750, and was considered by many to be the best Kawasaki so far. Four-stroke, four-cylinder, street model. Has 4-into-2 exhausts, sealed-in grease drive chain, and starter lockout switch. 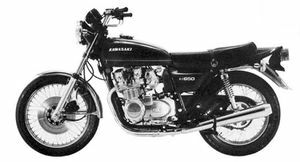 This four-stroke four-cylinder motorcycle boasted double overhead camshafts just like the bigger Z1 and Kawasaki claimed 64 BHP from the 652cc motor. Unlike the Z1, the 650 used a plain bearing crankshaft and used a primary drive chain instead of a gear driven unit. A single 245mm disk was used up front with a 250mm drum on the rear, more than enough to handle this relatively lightweight bike. It was offered in two colours, candy super red or candy emerald green, the green proved very popular in the UK. Major Changes: Color, carburetors, brake caliper position, brake master cylinder, and generator. Disphragm fuel tap and 4-way flashers adopted. Needle bearings are used in swing arm. The front calipher was moved to the back of the fork leg; master cylinder was changed from a round to triangular configuration. A three-phase charging system replaced with two-phase; regulator and rectifier were now a combined unit. The footpegs were now rubber mounted. Two colours were offered for 1978, luminous dark blue or luminous burnt red. These proved to be unpopular and the B2 sold no where near as well as the B1. Very few other differences were made to the B2. The front brake caliper was reversed to the back of the fork leg and the front master cylinder was changed from a round item to a triangular one. The charging system was changed from a three-phase system to a two phase and the regulator and rectifier was now a combined unit. The cam chain tensioner was changed to an automatic unit and a hazard switch was added to the left-hand switchgear. Needle roller bearings were now used in the swingarm instead of the previous model bushes and slight modifications were made to the carbs to improve low speed operation. The fuel tap was replaced with a diaphragm type unit. There were also slight detail changes to the outer engine cases to incorporate the new lower case Kawasaki logo. The front footrests were now rubber mounted to combat vibration and the front forks were slightly modified. Remarks: Street model. 4-into-2 exhausts. Automatic camshaft chain tensioner. The only difference over the B2 model was a change of graphics and a return to the original green and red colours. Sales once again picked up. The new lower case tank badges were also used. This time the red colour was described as candy persimmon red. This page was last edited on 21 January 2011, at 00:21.